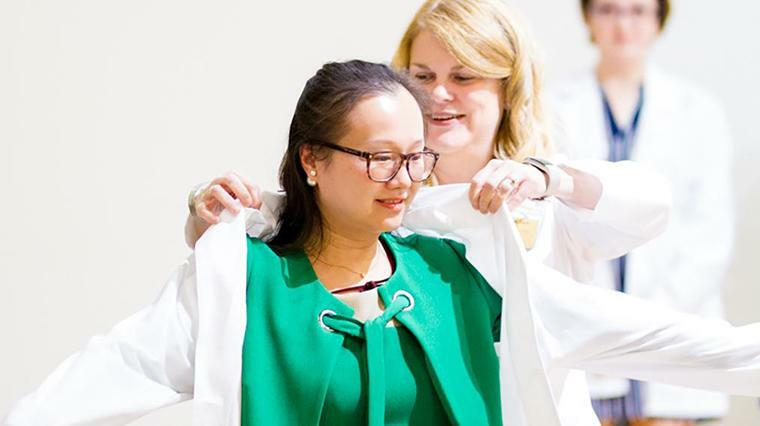 Each nursing student participates in the white coat ceremony at the start of the clinical level of the nursing program. 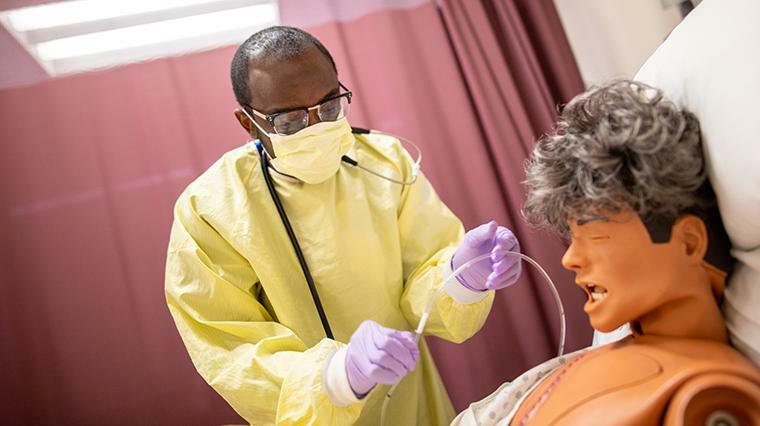 Gain hands on experience in clinical settings and our nursing simulation lab. Explore nursing in another culture through our cross-cultural program. The senior nursing students pictured above spent 16 days with Midwives for Haiti. Whether you were inspired by a nurse you know, you love the idea of helping others, you enjoy science, or you like the stability and reputation of nursing, EMU's traditional, 4-year bachelor of science in nursing will help you become the best nurse you can be. Our program prepares you to become a generalist Registered Nurse, a career in high demand across the country. You will be ready to serve and lead in a variety of nursing settings. Our graduates are also prepared for further graduate studies, like a masters of science in nursing and a doctor of nursing practice. EMU nurses care for the whole person, family and community. Our Sacred Covenant of Nursing emphasizes service, empathy, self-giving love, empowerment, and the nurse-patient relationship. We teach you that nursing is more than a job. 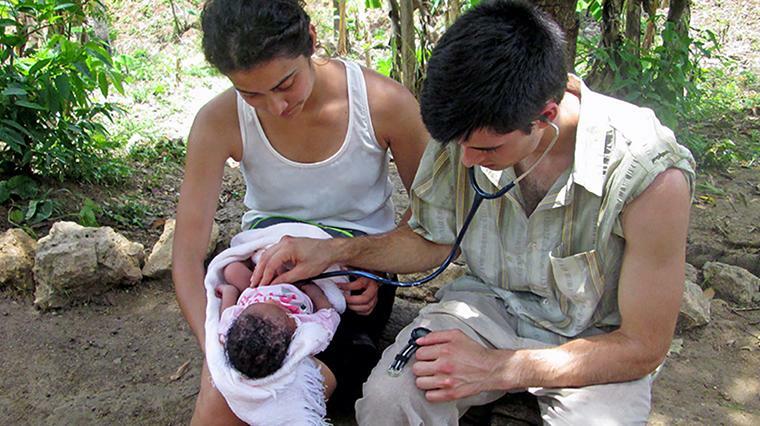 Nursing is a vocation that allows you to practice justice, kindness and mercy. You will develop your own personal art of nursing, understand important and sacred moments and places, and respect for all people. In your first two years of study you will complete lab work in our state-of-the-art science facilities. Our cadaver lab gives nursing students an opportunity to explore the human body up-close in anatomy and physiology courses. Any student admitted to EMU may declare a nursing major, but all students must complete an application to begin the clinical level of the nursing program which typically begins during the junior year. Students may begin the clinical nursing program in either the Fall or the Spring semester. Once you have been admitted to the clinical portion of the nursing program you will complete more than 500 hours in a clinical setting. Starting in your junior year you will complete all-day clinical rotations. Our students complete clinical training at various locations, including: Virginia Mennonite Retirement Community, Sentara RMH Medical Center, UVA hospital, Western State Hospital, August Health Center, local schools and various Virginia Department of Health locations. 100% of spring 2018 nursing grads were offered and accepted jobs before graduation. After completion of the program, graduates take the licensure by examination for registered nurses, administered by the National Council of State Board of Nursing, Inc.